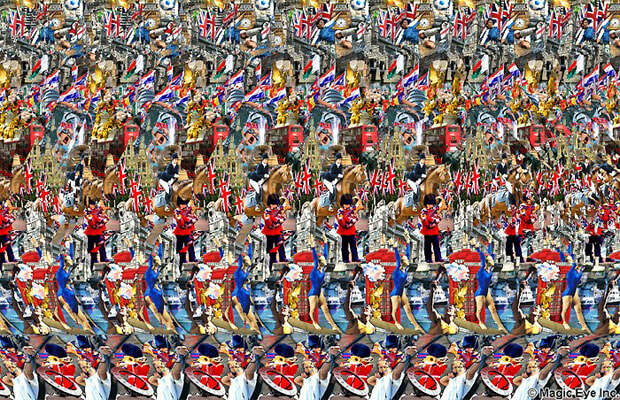 It&apos;s been years since we last gawked at a Magic Eye poster, the mystifying optical illusion décor every &apos;90s kid had hung on the walls of his bedroom at some point during his childhood. At first glance, Magic Eye appears to be nothing more than a kaleidoscopic blur of images, but soon dolphins and sharks magically begin appearing after a few moments of staring. Now the magic has returned and made its way into the music video of Young Rival&apos;s latest song "Black Is Good." The band teamed up with director Jared Raab and digital artist Tomasz Dysinski to create this trippy visual. Like the iconic optical illusion images of yesteryear, the music video for "Black Is Good" utilizes random dot autostereograms to project the eventual images. For those who don&apos;t know, "random dot autostereograms" just means to use repetitive patterns in a two-dimensional space to create the illusion of three-dimensional depth.